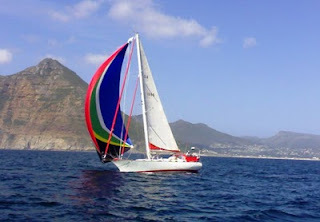 L34 "Sensation" skippered here in 2006 Admirals Regatta in Hout Bay. She won the event comfortably and took the sword in 2005 (Mark Sadler) and 2006 (Andrea Giovani) if memory serves . . .
﻿L34s have always intrigued me. Most yachts are easy to pigeonhole as cruisers, racers, small or large, comfortable or fast, but seldom all of the above. A number of 34 footers seem to have it all - perfect all rounders. In SA we have the L34, the Stadt 34 and the Didi 34 (already reviewed). At 34' a yacht can have generous accommodations without compromising its performance, be capable of ocean passages, and quite comfortable all at once. They are a good choice for offshore racing, round the cans racing, and easily converted to performance cruisers - enter the Holiday 34 (tailored slightly for cruising). Additionally, in South Africa, they have a large and active class association, and are by far the biggest class in this size in South Africa. As far as I know the L34 class was conceived and driven by Dave Cox - also responsible for the L26 and obviously with a very clear view of what South African yachtsmen were looking for! I don't know the history, but between him and Angelo Lavranos (the designer) they came up with the L34, and most were built by Roberston Yachts in Cape Town. And very well built by all accounts. Designed as production boats from the start, they made a great one-design class, affordable for serious offshore racing, with just the right balance of ﻿performance, safety, comfort and handling. The design is what I would call "modern-moderate" in all respects, with swept fin-keels, spade rudders, flattish underbodies, average beam (10'10"), average Displacement/Length ratios, and conventional fractional sloop rigs. Tillers are found on the L34, whilst the Holiday 34s seem to have wheels. At 4300 kgs they are light for their size but not super-light. Draft at 1.8m includes a fairly deep and powerful keel. They do very well in the blustery Cape waters, and are considered very safe. Hout Bay Yacht Club has had several L34s based here over time, and we have had many racing here in our Admiral's Regatta. The picture above is of "Sensation", a very well known and well-campaigned example which has an amazing race record. 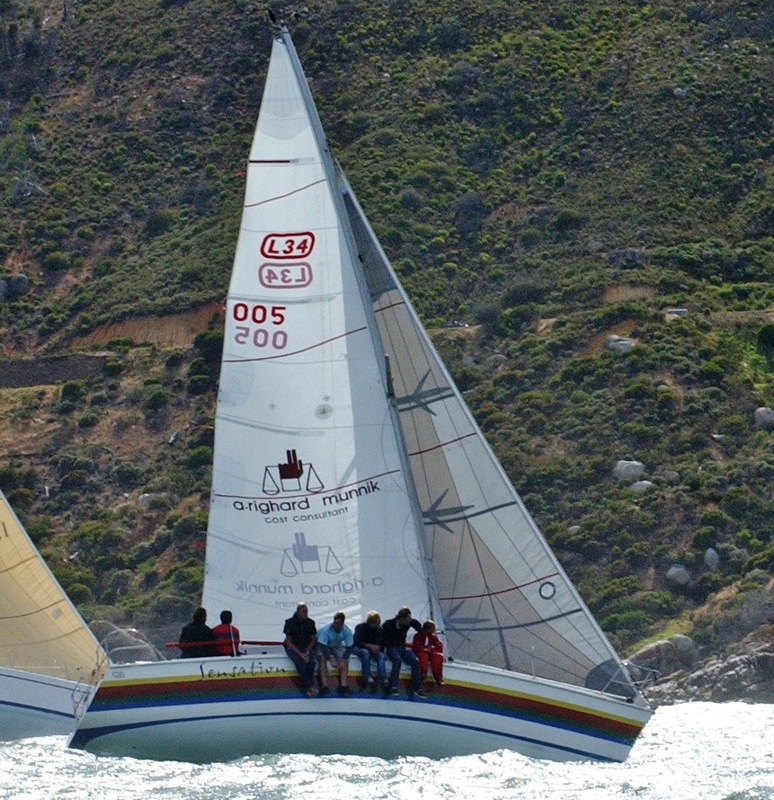 I have seen it sailed in two Admiral's Regattas in Hout Bay - skippered by no less than Mark Sadler one year, and Andrea Giovani the next - in both cases it won the event . . . Probably the best testament I have heard for the L34s comes from an old sea-salt yachtmaster we had living here, who was also a sailing instructor (L34s are very popular training yachts as well). As a veteran cruiser, his preference was for long-keel ketches loaded with salty gear - safety, seakindliness, strength, anchors, drogues etc etc etc - but he did concede the L34s were as good a boat he had ever sailed for storm conditions and was also full of praise for the build quality. They routinely pop into Hout Bay from Cape Town and Langebaan in all kinds of conditions, no problems I have seen! Unlike some of the big-name tupperwares . . . The rig, lines, deck layout, and interior layout are all very conventional and functional. No suprises anywhere. The execution is clean and efficient, and you simply don't want to change anything at all. Interior is very spacious and functional. The engine is mounted under the stairway, but easily accessible from a removable cover. Galley, chart table, saloon, heads and fore-cabin all very adequate and useable. L34s tend to be well maintained and have aged very well. They hold their value and are generally priced around ZAR 450-500k in good condition (2011). They are a rare combination of great design, build quality, and a well conceived format. As a matter of interest the L34s are often seleted as the reference boat for PHRF handicapping, being the scratch boat at 1.000. The Holiday 34 was the cruising version - with some minor changes including a more fully fitted interior, a slightly shallower wing-keel, and a steering wheel helm. I don't think the rig was reduced but if so it isn't noticeable. HBYC has a great example on the moorings - its a fine looking boat and just makes you want to go sailing! The 10m Solar cruiser appears to be an updated L34, again commissioned by Dave Cox. It is designed as a wooden build, with a fair bit of extra performance. Remarkably similar to the Didi 34 in my view, these designs have little left to argue over . 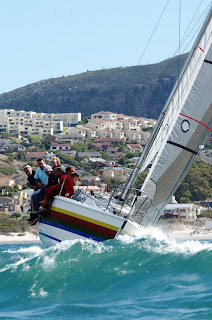 . .
Sheer Tenacity on an early test cruise outside Hout Bay. Photo taken with a cellphone, but its one of my favourites! ﻿The ultimate cruiser should have a (1) traditional soul and good looks, (2) easily handled, (3) comfortable at sea, (4) safe as a house, (5) great to live in (6) affordable (7) fast! - not necessarily in that order. My definition of course, but if you agree then the Shearwater 39 is one of the best examples around. The example I am most familiar with is Rod and Mary's "Sheer Tenacity" - now cruising very happily in the Caribbean (http://svsheertenacity.blogspot.com/). 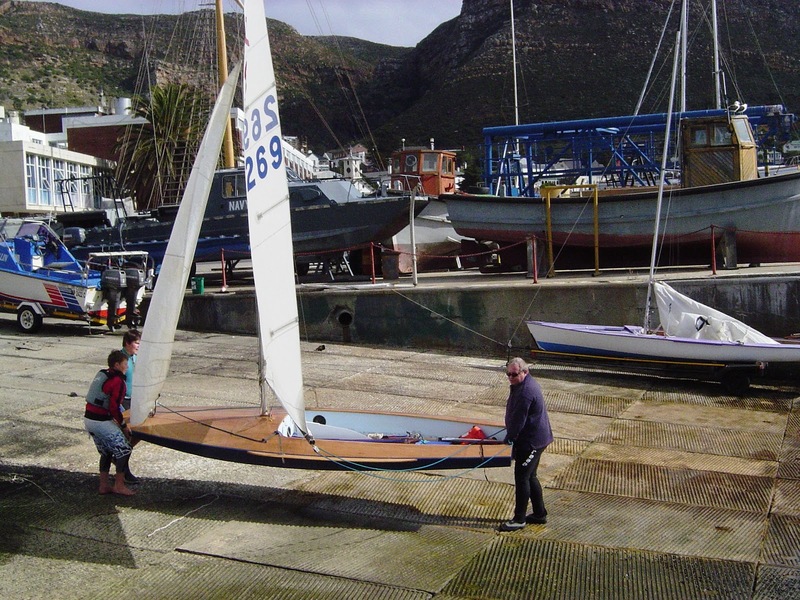 Rod and Mary are great folks and members of Hout Bay Bay Yacht Club, and the story behind the boat and its name is quite interesting, I'll tag it below as an add-on for those interested. 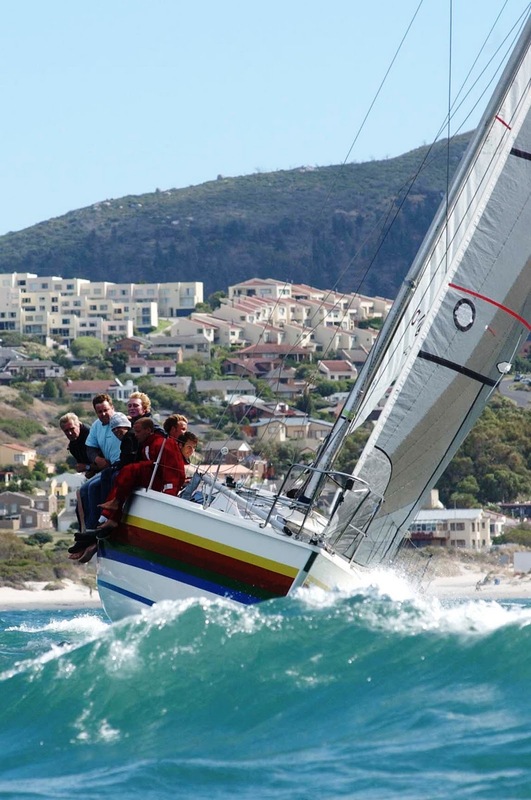 Hout Bay Yacht Club has had several Shearwater 39's around, and almost all our old salts have done time on them, including of course Dudley Dix, the designer. Another notable one is "Ukulele Lady", which belonged to our illustrious singer and radio personality Nick Taylor, another member of the club, and which saw an interesting party off to Rio just a few years ago. There's also Chris Hull's Sea Lion, and of course Peter Muziks's Shoestring, all well known to us, besides many others I don't recall the names of. The original one however, was conceived and commissioned by Gerfried Nebe (our local celebrity boat builder, who built his in wood). As I remember - Gerfried - who had done some extensive cruising in a Miura - wanted something bigger and faster, but not losing any of the great qualities of the Miura (see earlier post). Dudley Dix was automatically selected for this important job - our resident designer guru! - and came up with the Shearwater 39. How does she match the definition I posted as the ultimate cruiser? Traditional Soul and Good looks! Sailboat Cruising is undoubtedly a romantic pursuit! Spice islands, parties abroad, storms, adventure and sheer bliss in the warm climes. Why do this in a slab-sided boat, or a tupperware for that matter? Traditional cabin top, portholes, wooden trim, butterfly hatches, bowsprit and cutter rig! Shearwaters are popular wherever they go, and amazingly people treat you better when you have a good looking traditional looking boat! The Shearwater 39﻿ has a cutter rig (sloop cutter) - a proper cutter rig, which not only looks good - it makes the sails smaller and easy to handle. This also reduces the loads on the winches and rig, making her safer and stronger, with great options for reduced sail in storm conditions. The moderate keel and skeg-hung rudder make her quite responsive and manouevrable, and the flat deck surfaces are easy to move on. The moderate beam and and moderate keel (with rudder well aft) make sure she will track well too. With the usual amenities of a stack pack, roller furlers, and an autohelm, she is easily shorthanded by a cruising couple. A cruising asymmetrical on a furler or with a snuffer is normal. Fine clipper bow, moderate wineglass sections, moderate displacement/length, good flare in the bows, excellent weight distribution - you don't get really much better in a cruising hull. Add the deep aft cockpit - the only other parameter that can increase comfort is size, but at 39' and > 9 tons you are already rubbing shoulders with the big guys. Shearwaters tend to be reassuringly stiff and stay reasonably level, good qualities for passagemaking. Its the sort of boat one would agree to sail "back from Rio" as I have heard more than once in the bar. Let's not forget the Skipper and the Builder have equal responsibilities in the safety department. But design-wise - you need a boat with a good stability curve, a fair bit of overall mass ideally, a safe cockpit, manageable rig, and decent steering. Additionally, good buoyancy in the ends, and a secure galley station. Tick them all. The Shearwater has a cavernous interior - really big for a 39-er. The layout is conventional and simple, with the usual Dix idea of having the engine under the galley counter. In a 39' boat this works very well for many reasons (engine acess, weight distribution, prop-shaft angle, secure galley area), while not intruding in any way. The cockpit is economical in size for a 39-er, but ideal for its intended purpose as a passagemaker, and a liveaboard boat, where one wants to optimise the sailing aspect and accommodations below. It places everything at the hand of the skipper, and is ideal for singlehanding. It is more than adequate for a small party in harbour (been to several!). The Shearwater was originally designed to have a tiller - and I guess thats what I'd have - but nearly all now have wheels. The tiller folds away in harbour, is trouble free and simple, and looks good, while the wheel takes less strength to handle, and appears to be expected now in boats this size . . .? I guess this is relative! However the Shearwater makes use of simple materials, low rig stresses, smaller winches, transom rudder etc. It offers the accommodation of a much larger boat, due to the cabin roof and cockpit shape. The traditional looks make it very attractive without resorting to high-tech adornments like carbon wheels and fancy rigs - they are essentially semi-corinthian but look like an art classic! Best of all - Shearwaters hold their value very well and are treasured by cruisers all over the world. (The Shearwater brand is famous for the Shearwater 45, which received "Best Traditional Voyager" and "Best Cruising Boat" in the Cruising World Boat of the Year 2001 Awards. 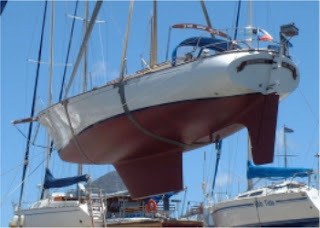 The traditional topsides hide a very advanced underbody, and the rig and keel are very powerful, on all points of sail. So the Shearwater goes much faster than it looks. It even goes faster than fast-looking boats sometimes. Peter Muzik on Shoestring did a blistering time (10 days) to St Helena a few years ago - in the Governor's Cup race. Dudley explains this better in his own commentary, but my experience is identical - pacing Sheer Tenacity with a DiDi 34, I was very suprised how she moved, and with the comfort and dignity of a battleship. The "enigma" of the Shearwater is shown in the picture below. The fine wavepiercing bow has quite a deep foot, giving her waterline length in front, while the flat run to the traditional oval shaped transom is more than a bit sporty, particularly if she's heeling a bit . . . . " See http://svsheertenacity.blogspot.com/2009/01/ideal-cruising-boat.html for more commentary on their perfromance. note also the simple semi-balanced transom rudder on that traditional stern - it really "looks the business"
Shearwaters have any vices? Are they perfect? This is what I asked Rod Turner Smith after about two years of ownership and one year of cruising, mostly passagemaking. Rod had this to say: "Justin, a lot earlier in our travels, you asked if I felt that the Shearwater was the ideal cruising boat. We have now done just over 4000nm in "Sheer Tenacity" since we left Cape Town last month, and have had time to assess her performance , and time to learn how best to trim and sail her. The answer is unequivocally YES!! She is an absolute joy, and a real passage maker! Not only is she good on all points of sail, but she is naturally fast, spacious, and better ventilated than any other boat I know. She is also a real "looker", and commented upon wherever you go! A great combination of classical elegance, and efficient yacht design. Her reputation preceeds her, and people from all over the world recognise them, and respect them. Gerfied and Dudley certainly hit the jackpot with this boat, and I cannot believe that only about 25 of each size were built, and.. that we are lucky enough to own one! So Rod seems more than happy! Having said all that - each boat is designed for a specific purpose, and all are compromises. The Shearwater is the sort of bluewater cruiser you would buy if you want to go places and really sail, including the Southern Ocean if necessary. If you specifically need shoal-draft, or a large enclosed centre cockpit for very cold climes, or a floating caravan, etc you may want to look a bit more widely. But if the Shearwater meets your needs - look no further! See http://www.boatus.com/cruising/ithaka/specs.asp for another amazing account of "Ithaka", owned and sailed by Bernadette Bernon, the editor-in-chief of Cruising World for over ten years. When she picked a boat for her own cruising - it was the Shearwater 39. They voted it "Boat of the Year" in 2001 I think. See http://www.dixdesign.com/sh39.htm for the Dudley's comments and the technical detail. Rod and Mary, originally from JHB where they were enthusiastic outdoor lovers and 4x4 enthusiasts, moved to Hout Bay a few years ago to escape the rat race etc etc. In no time at all, they had bought a Miura (4x4 of the sea), called Tenacity (mentioned earlier in this blog), and practically rebuilt her - including a full osmosis treatment done at home, and basically everything new. 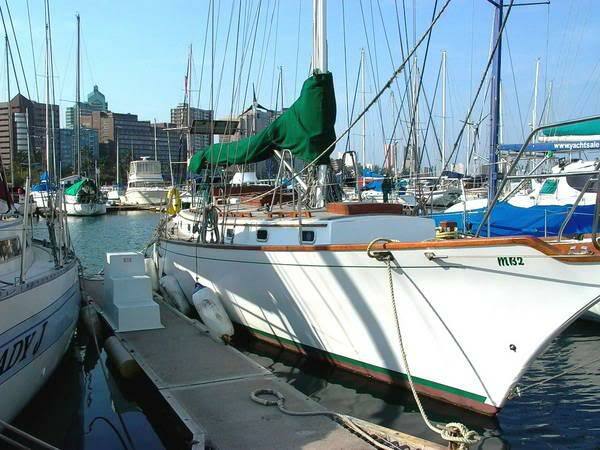 Rod - never one for half measures - received a terminal dose of the sailing bug - and simultaneously bought a large old Roberts boat (about 53' if memory serves) - called "Gambula" or similar, with the goal of doing some extended cruising. Gambula came with loads of good kit - mast, rig, engines etc, and Rod moved her up to their house in Meadows (across the road from the Nebes in fact). Then he started working on her. I guess it was quite fortunate that it happened right in the first few days - he fell through the rotten hull near the stern! One can only imagine the suprise and emotion that this must cause - I don't have the words for this kind of thing. At least not printable ones. A "chainsaw party" followed and that was it for Gambula. Anyway, never being one to lay down and give up, Rod and Mary took a quick decision to sell their beloved rebuilt Miura (yes I know), and buy the last new Shearwater mould from Achesons yard. Again this was a bit testing because the yard was being liquidated and they had to move it out p.d.q. at one point. Then came a long and arduous job of fitting it out - Rod worked fulltime for about a year and a bit to do this, moving much of the kit over from Gambula, which was still perfect. The woordwork and standard of finishing was damm good if I may say, and the rigging, fitting and electrics all top class. 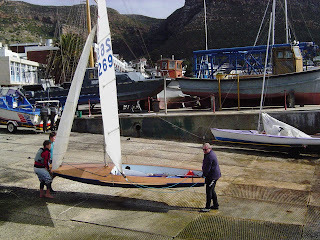 Eventually she was launched and Rod and Mary sold their (rather lovely) house and moved in to her in Hout Bay, taking a year or so to get everything sorted before going cruising. She is not called Sheer Tenacity for nothing! - and remains an inspiration on how to convert adversity to advantage! Read their blog! 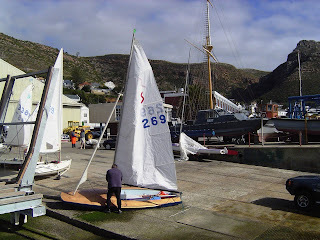 I have been motivated to do a review on the Sonnet for a number of reasons - (1) a new CNC kit is about to be launched (CKD Boats) (2) the Sonnet Sailing Association has a whole new breath of life and energy (3) Sonnets (along with Dabchicks and Tempos), are the brainchildren of a great dinghy designer, the late Jack Koper, an ex-Capetonian, and (4) I have personally built and owned two Dabchicks and one Sonnet (S269 - which I still own). Very close to home then! It was these boats, built in 1965-73, that got me hooked on Sailing and Boating, and for which I owe my Dad a whole bunch - we learned carpentry and sailing at the same time back in those years. Dabchicks probably account for more accomplished sailors in SA than any other class to date I reckon! ﻿The Sonnet was designed in the early 70s - about 1971 as I recall. Jack designed the Dabchick first, the Tempo second, and the Sonnet 3rd as an in-between. Along wth the Dabby, it has become the most enduring design - and its a great credit to these designs that they live on after so many popoluar dinghies of that day have faded away. Sadly, the huge dinghy fleets of the 60s and 70s of Sharpies, Finns, Fireballs, Flying Dutchmen, Enterprises, Spearheads, Sprogs the odd Flying Fifteen etc - all gave way to Hobies, Lasers, Oppies, 09ers etc. Of the old-timers, Sonnets, Dabbies and Extras appear to survived best, and certainly in the Cape the Sonnet remains a very popular and active class. Its not an Olympic Class, but a great local class to put your hat in! What makes the Sonnet so popular? As a scow dinghy, it is flat, wide, stable and planes very easily. The beam makes it easy to get the ballast out wide, and the boat is easy to control and very forgiving. 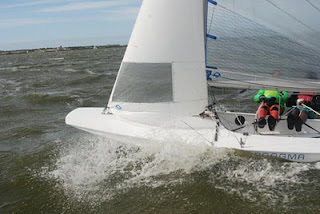 Ideal for strong wind, when dinghy sailing is most fun. Further, they are easy to handle (simple rig) - ideal trainers, but also very rewarding to experienced sailors in strong wind. A Sonnet in 25 knots on a broad reach is a truly unbeatable experience. I can't tell you the speed (before GPS) - but I can tell you the water jet that sprayed up through the centreboard casing flew clean over the transom, and only a small piece of boat would touch the water. Whilst many other dinghies compete well with them in lesser winds, the ultimate sense of speed belongs to the Sonnet! Well, to be fair - credit also to the Dabby (if you are small), the Tempo and Fireball (if you are a pro, and have a pro-crew as well). The Sonnet however, is the most acessible - easiest to build and own, and is also a great boat for single-handing. 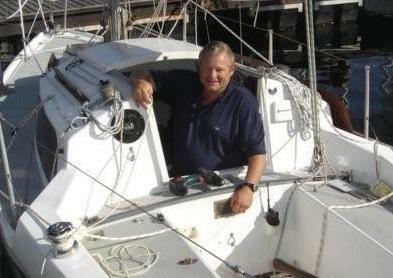 If you really want to learn to sail, learn to sail a monohull dinghy first. Its also the best way to learn single-handing - and the Sonnet would be the recommened boat every time, if you ask me. Historically, most Sonnets were homebuilt - from Jack Koper's detailed plans (hand drawn) - using marine ply, meranti, and decent glue. It was inexpensive, not too difficult, but quite time consuming. No problem with this - but these days many people dont have the time or space to build there own boats from scratch - though I can vouch this is as rewarding as the sailing itself. In more recent times, Steven du Toit in Zeekoevlei has built a good few dozen Sonnets (very) professionally, and word now is that he is busy with a GRP version. However - professionally built boats are not exactly cheap! 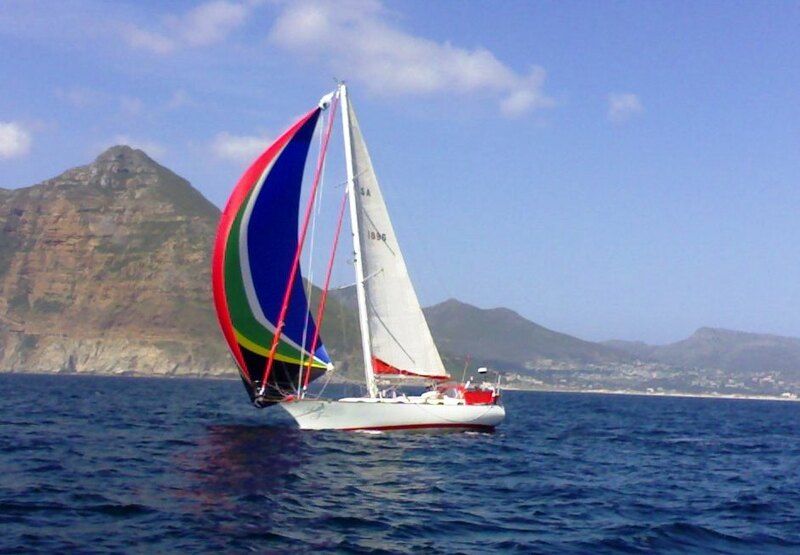 Don't ask me today - but I have seen pro-dinghies from R30-50k and some people say more . . .
Do Sonnets have any drawbacks? They don't point as well as pointy-boats in light winds. That said, they aren't bad, and still cover the course faster than many equivalents. Plus, pointing high in light winds hardly compares with the adrenalin of a planing broad-reach! They aren't Olympic classes, they also aren't high-tech - but they are inexpensive, ideal club boats, and very rewarding. In South Africa, Sonnets Rule! At least in this class. Internationally, and for those seeking a modern high-performance kit boat, see also Dudley Dix's Paper Jet 14. See http://www.ckboats.com/, and http://www.dixdesign.com/. 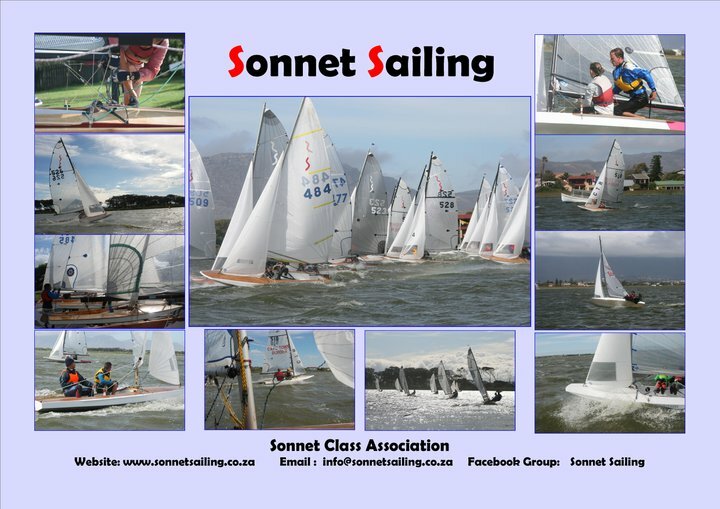 Credits to the Sonnet Sailing Association for photos. 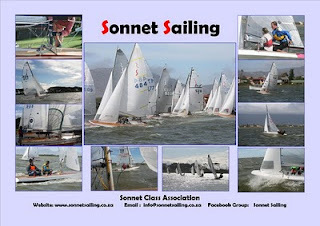 For more info please see www.sonnetsailing.co.za.